MSC Cruises, has been coined the “sleeping giant” of cruise lines in North America, but has now officially emerged from her slumber. 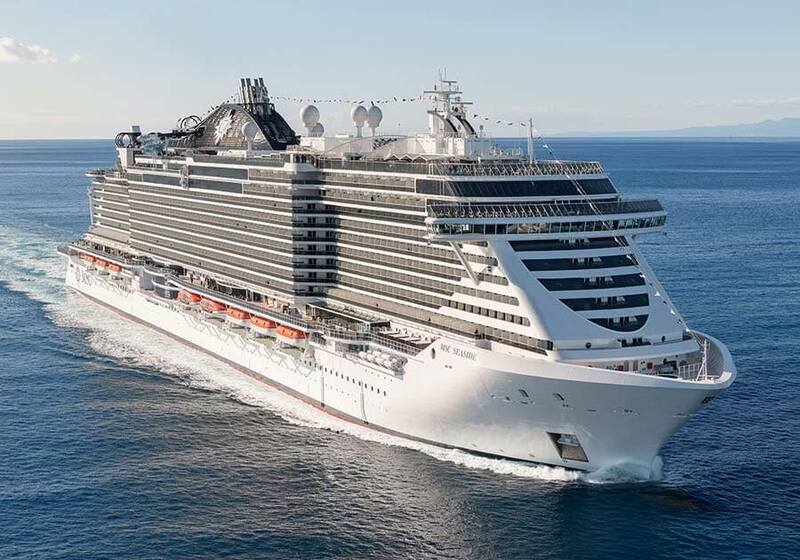 As the current market leader in Europe, South America, and South Africa, MSC Cruises has been a globally recognized brand, but as the brand now delivers the newest flagship to the United States, MSC Seaside brings a new awakening to Caribbean cruising. With twenty decks, eleven dining venues, six shows and even a snow room- the MSC Seaside delights her guests with a unique experience at sea. I was fortunate enough to attend her Naming Ceremony on December 21, 2017. Beyond the glamour of Sophia Loren (MSC Cruises’ fleet godmother) cutting the ceremonial ribbon, or the inspiring performance by Andrea Bocelli, the ceremony truly celebrated a company that is making a name for itself world wide. As the world’s largest privately held cruise line, the company made powerful reference to it’s claim to fame with container shipping, which remains the second largest shipping company in the world. Docked alongside MSC Seaside for the Naming Ceremony, was an MSC cargo ship, to showcase the full spectrum of the Mediterranean Shipping Company (MSC). The brand, which seeks to offer a unique, Mediterranean inspired experience to guests is a much needed breath of fresh air in the cruise industry today. So what exactly differentiates the MSC Seaside from other cruise ships? While many of the ships in MSC Cruises’ fleet are described as beautiful, the Seaside takes the interior appeal to the next level. Adorned with MSC Cruises’ signature Swarovski crystal staircases in the atrium, each step (valued at $33,000 a step!) sparkles in the light. If chocolate suits the mood, simply visit the Venchi Cioccogelateria & Coffee Bar, where a chocolate fountain invigorates the senses (particularly the olfactory senses, with a most incredible aroma!) The MSC Shops, offer everything from perfumes, designer apparel, duty-free liquor, fine jewelry, logo items, and much more. For fine dining, guests have a wide selection of options. A personal favorite is Asian Marketplace Kitchen, by celebrity chef Roy Yamaguchi. Whether it be sushi and sashimi, or a traditional teppanyaki experience with full theatrics, this is a culinary experience to be savored. Ocean Cay, a specialty seafood restaurant onboard offers breathtaking views of the sea, with premier service, as the restaurant intimately seats thirty guests. Butcher’s Cut, a classic American steakhouse is a perfect choice for those who enjoy an excellent filet mignon or rib eye steak. For buffet lovers, this ship spoils guests with two buffet locations offering a wide range of cuisine, breakfast, lunch and dinner. By the way, the pizza and pasta dough is made freshly onboard each day, guaranteeing the quality of the Mediterranean specialties. MSC Aurea Spa onboard the MSC Seaside is a location not to miss. The largest Balinese spa at sea, this venue boasts private spa cabanas for full or half day use, a thermal area, complete with aroma-infused showers, saunas, steam rooms, and even a snow room at sea! New to MSC Aurea Spa is Andrea Bocelli’s Vino Therapy, which offers guests Tuscan wine-infused spa treatments and products for a variety of needs and skin concerns. Powered by MSC’s partnership with Technogym, the fitness center boasts state of the art equipment, personal training and new classes to provide guests with a well-rounded approach to wellness. For those who enjoy activities, the zip line on deck 20 cascades over the pool deck for beautiful views of the ocean below. The MSC Seaside also offers an interactive waterpark, with two thrilling waterslides that extend over both sides of the ship. The ship itself has six swimming pools, a bowling alley, 5D cinema, Formula One simulator, and more. Beyond her many beautiful venues, MSC Seaside brings guests back to the sea. While she’s a large ship, views are not lost, with glass elements, immense outdoor deck space, and the majority of staterooms onboard offering ocean views. There’s a special magic in traveling by cruise ship, a subtle romance and aura of peace at sea. MSC Seaside reconnects her guests to the ocean, allowing them to experience the true beauty of the Caribbean onboard. MSC Seaside celebrates the joy of cruising, and truly delivers a world class experience with Mediterranean flair and style. This report was prepared by Kelly Corbett on December 1, 2017. The views expressed as solely those of the author and not necessarily those of WWTCA.